We are genuinely the best 60's band in Melbourne. We are the real deal. You will not be disappointed. We are expert at making 40/50/60th birthday parties come to life. If you want to recreate the 60's for your friends, we know what buttons to press. We can play a mixture of quiet acoustic music at the start of the evening and then move into the electric R&B of the early British Invasion, get all psychedelic for a bit and end up with the rock anthems of the late 60's. Along the way we will celebrate the West Coast folk rock boom and pay tribute to Bob Dylan. We can also run a small TRIVIA COMPETITION is you're so inclined. We are happy to negotiate to fit in with whatever schedule or theme is required. We all have dark suits if a more formal approach is desired. The main thing to note is that we are not your average bunch of hack musicians eg. we do not play 'Nut Bush City Limits'! We are all very experienced musicians with credible musical careers, we're passionate about the music we play and we'll make your party truly memorable. Sound advice in regard to venues : when you are looking for a venue for your party, try to stay clear of polished floors, lots of glass windows, concrete and tin roofs if you want to hear us play clearly. Instead try for rooms with carpet (not on the dancefloor! ), drapes or textured surfaces. Check out what other people have said about us. CLICK HERE. We have done quite a few weddings for younger couples doing for it for the first time but also for older couples doing it for the second time. Particularly for younger couples, we find that a fantastic party atmosphere develops because often 60% of the guests are 40+ and they tend to not be familiar with 80's & 90's music. On the other hand, most younger people are fully aware of the impact of 60's music on the trends of today eg. the successive waves of Brit pop, the melodic US indie scene and the numerous remakes of 60's songs. 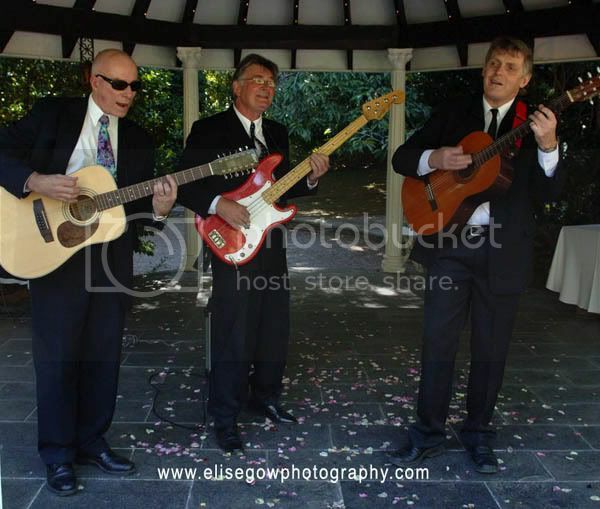 We are able to play a fully acoustic unplugged set if an outdoors setting is to be used. We are happy to negotiate with a couple to fit in with whatever schedule or theme is required. We all have dark suits if a more formal approach is desired. By the way, if you're looking for a good Wedding Photographer, we recommend Elise Gow. The main thing to note is that we are not your average bunch of hack musicians eg. we do not play 'Nut Bush City Limits'! We are all very experienced musicians with credible rock music careers, we're passionate about the music we play and we'll make your wedding truly memorable. or phone Peter on 0419 306 454 anytime. What do people say about us? CLICK HERE. Performance fees are negotiable relative to the venue's distance from Melbourne, the nature of the performance and the duration of the gig. We normally play 5 x 30 minute sets but this is also negotiable. Interstate bookings can be arranged.